It's always a bit of a thrill when the garden begins producing. One evening this week I thought I'd go out with a small bowl and see how many ripe strawberries there might be. I ended up returning to the kitchen for a bigger bowl and filling it to the brim. Sweet and juicy strawberries are a great way to kick off almost-summer. Then I pulled up a bunch of radishes. I got mine in late this year; usually they are the first thing to harvest. To go along with dinner last night I paired the radishes with cucumber, fresh snipped chives, and a simple dressing with olive oil, white wine vinegar, salt and pepper. Crisp and delicious. Bring on summer food! My potting bench needed a serious tidying up, so that was done this weekend. I cleaned up the paperwhites from Christmas (still in their glass containers), scrubbed pots, threw away old plastic pots, and swept off the bench. It looks much better now and is actually usable for potting, not just for throwing things onto. The stars of the garden just now are the roses and peonies. I'm torn between clipping them for the house and leaving them in the garden. Fortunately, there are enough to satisfy both places. I've been talking to the roses and peonies out in the garden, complimenting them on their showiness. I do it quietly as I wouldn't want the neighbours to think me entirely batty. A day or two ago, I heard my neighbour talking: "Good morning, Mrs. Robin," she said, "I can hear you singing your pretty song." Instantly, I felt better. Do you talk to your garden or the wildlife that happens by? Linking with Mosaic Monday, hosted by Maggie of Normandy Life. That last part made me smile! I don't talk to my garden, but I certainly have conversations with the birds and rabbits and squirrels and the occasional cat who pass through my yard! 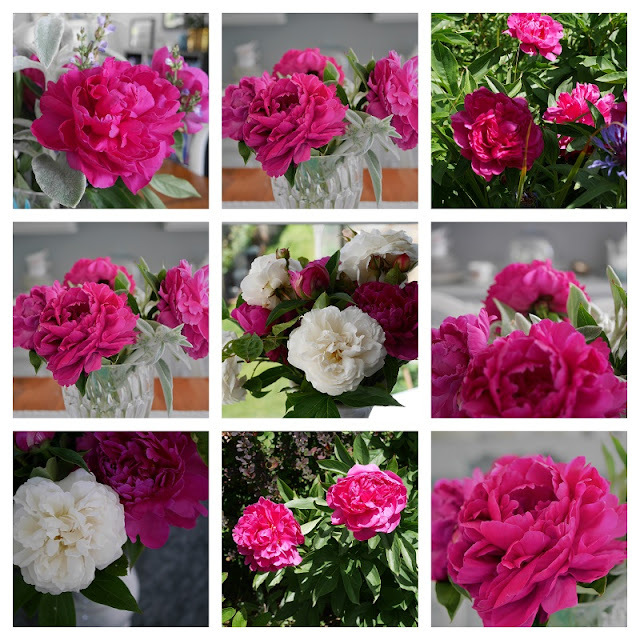 Luxury is having enough peonies for the garden and the house! I always talk to my garden! Plants thrive on encouragement. Your roses and peonies are far ahead of ours, and are so beautiful. Yes, I do. I yell at the squirrels scrambling up and over anything, I chatter with the chipmunk and the birds, and I sympathize with the flowers for their having such a bad gardener who does not water them as she should. Now I want to chat about nuts and bolts...I see you have followed some others in this new blog format. It makes a post appear beautifully on the page and it also holds a comment without flipping out. On the other hand, there are things I do not like about it. Just wondering how you are finding it. I talk to my trees all the time, not my plants just my trees. Your garden looks fantastic, enjoy! It looks as if you gone serging ahead of my garden here - my strawberries are still white. I never thought about pairing radishes with cucumber but it looks delicious! I didn't get any radishes planted this year...Maybe in the fall. Your salad sounds wonderful and your peonies are beautiful. I do talk to my plants and the wildlife! A stunning mosaic! I don't think I've ever talked to the garden; I'll have to see if the Gardener does. Our garden is about to produce and we've barely had to water with all the rain. Nice. we are now naming the critters that appear on our night vision camera in the woods. !!!! so far we have had the camera capture a raccoon raiding our birdfeeder, (Raider is his name) and a lovely little deer in the forest meadow. She's names Miss Vito after the deer scene in My cousin vinny. Oh, what pretty garden goodies! Yes, I talk to my garden buddies. I talk to the geckos that live in the pots on my terrace, and once we had a hawk family that lived in one of our trees. It would sit on the branch above me as I worked in the garden and I would talke to it. Amazingly, it would sit and listen to me, moving its head as if wondering what I was saying. The strawberries look divine and the salad so good. A fantastic rosemosaic. I definitely talk to the wildlife. But I have outgrown talking to my plants (only because I don't have a garden any more ;>). I do love looking at the beautiful ones created by others -- thank you for sharing yours. I'm looking forward to Oregon strawberries when we get home. (They ripen here in Florida in February/March, which is still fun and a novelty, but honestly they aren't anywhere near as delicious as the ones in the Pacific Northwest!) And roses!!!! Peonies remain a memory because I'm pretty sure they'll be gone by the time we get home. Your strawberries look delicious...nothing tastes sweeter than home grown! Love your roses and peonies. I haven't been talking to mine....I must change that! heehee! I smile at them...does that count? Enjoy your day! I do talk to the birds, at least. On the walking path and in my garden, it often seems that one or another of them is being friendly with me. Also, when we are the only ones around, I want to acknowledge our companionship! I don't really talk to the flowers (I'm not much of a gardener), but my neighbours have probably heard me yelp out loud when I accidentally stumble onto a creepy crawly while weeding. Heh. Whether they be of strawberries, veggies or flowers...your photos are beautiful! I like your potting bench. I could see you have fun or blessed feeling growing them by reading "singing" part♪ By the way, I didn't know the word "batty" p;-) Your potting bench looks really tidy and handy. I have done anything to my blog; so I don't understand what to think about E-mail issue we have. Thank you so much for your sweet comment and Have a wonderful rest of the week. How wonderful that your strawberries are full in the bigger bowl! They look so fresh, and I see the rich soil for the radishes.I believe you must have taken care a lot for the harvest. Your flowers are so lovely. I like your potting bench,which reminds me of my old white bench painted by me. That was the one my mother-in-law used as a tea table around 70 years ago. I found the table thrown way in a hut. I decided to paint it white as my potting bench. The old table revived again. Your new blog format is so lovely. Sorry, honestly, I almost missed your post!!! Have a good new week、Lorrie. I’m envious of your garden full of peonies and roses, which must be the result of your green thumb. The mosaic is perfectly lovely. The look of radish/cucumber salad whets my appetite. Your potting bench looks tidy, all the tools look ready to be used. Oh my Lorrie, your homegrown produce looks so incredible, and that salad...yes, please! Yes, I talk to the birds in my garden, and shoo off the squirrels. Thank you for your visit to my blog. My comments aren't being emailed for some reason, but I wanted to thank you for your sweet comment. Your peonies are wonderful! I love this time of year in the garden! I love your delightful garden and it's delicious produce. Oh, those roses and promise are superb! That's beautiful - things just suddenly take off don't they - your garden produce looks delicious! Hi Lorrie, You certainly do have a green thumb!! Those strawberries look luscious, and your peonies are just spectacular!! Unfortunately, we've had so much rain here that most of the strawberries ended up as mush. So sad, as we just love strawberries. I like your potting bench. :D I agree with you about bringing on the summer food. I am a tad worried about what kind of local produce will be available in our area, due to the extensive rain and flooding we're having. Lorrie - those strawberries and radishes just jump off the page - so colorful and juicy looking. No surprise your salad has me salivating as well. I certainly do talk to my plants and to the wildlife - the difference is I don't have any neighbors nearby to think I am batty! Beautiful mosaic. Peonies are a favorite around here. What a lovely bounty of strawberries and radishes. The salad looks so refreshing. Happy June to you! Lorrie, love this post! I really must revive my garden. All I have to do is go to the garden center and get some soil amendments and plants, but I can't seem to get around to it! If I keep looking at your garden photos, though, I'm sure to get motivated! We had some wonderful British strawberries earlier ... delicious! Your peonies are gorgeous!!! And strawberries and radishes, what a wonderful early gift from the garden. I did buy a bunch of strawberries today and are they ever yummy. Your berries are beautiful!